Have you ever felt the need for a WiFi connection for your mobile devices, but all you have is your Mac and a wired Ethernet connection? 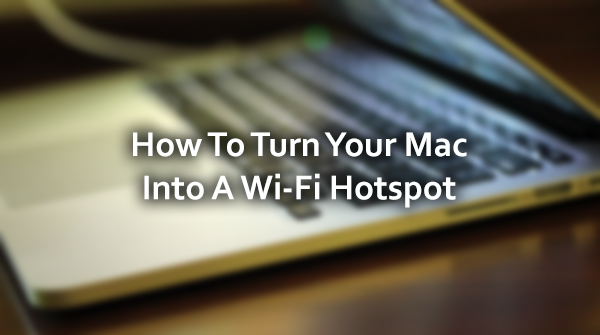 Luckily, there’s a quick and easy way to turn your Mac into a wireless hotspot so that you can share your Mac’s Internet connection with other WiFi enabled devices. 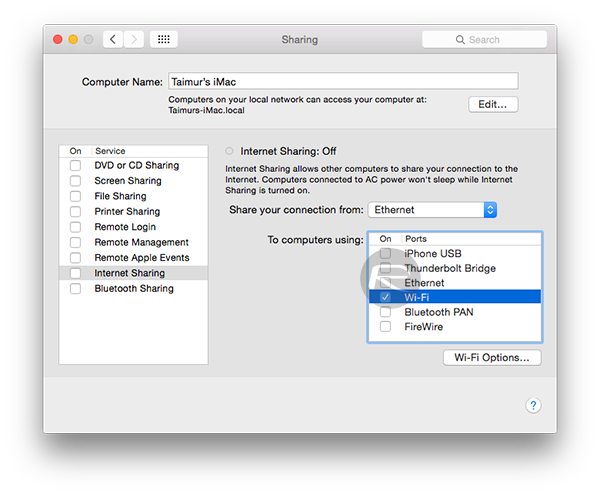 There are a host of other scenarios where turning your Mac into a WiFi hotpot can be useful, such as in hotels that only serve an Ethernet cable, places where WiFi signal is weak, or places where you can only connect one of your devices on the network. This nifty little trick should help you bypass all those constraints. 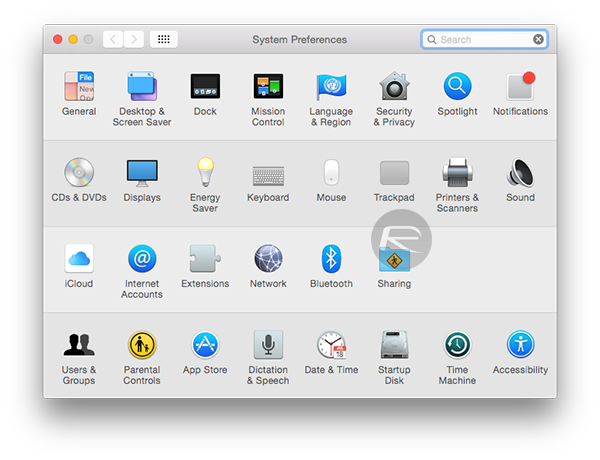 Step 1: To begin, launch the System Preferences app, and click on Sharing. Step 2: Select Internet Sharing from Service column on the left, and then click the ‘Share your connection from’ drop down menu and select your Ethernet port. If you have a newer MacBook, it could be named Thunderbolt Ethernet. Step 3: Select Wi-Fi from the list next to ‘To computers using’. Step 4: Now click Wi-Fi Options at the bottom, which should provide you with some options to customize your new WiFi hotspot. 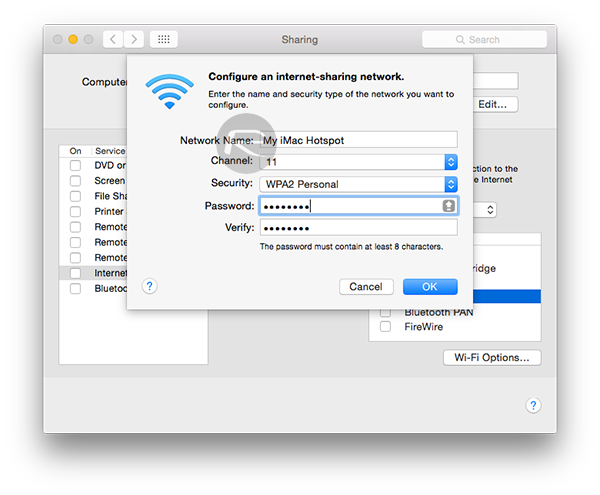 Step 5: Set a name for your WiFi hotspot (typically called SSID) in Network Name. More so, you can choose the type of Security to be used, and choose a WiFi password of your choice as well. When done, setting this up, hit the OK button. Step 6: You should be back in the Sharing window again. Place a check mark next to Internet Sharing in the Service box listed to the left, to turn it on. 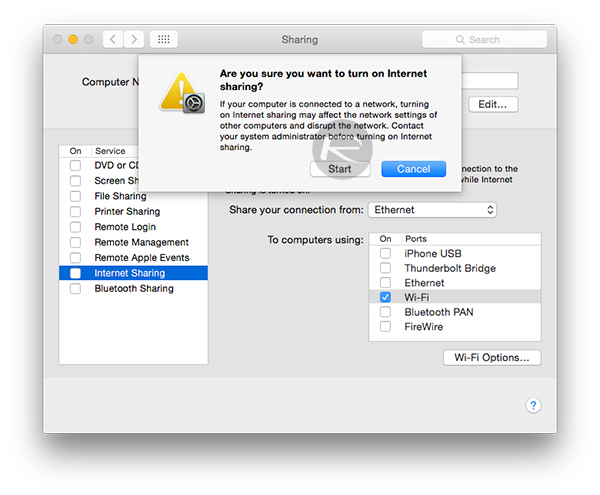 Step 7: You will now be prompted with a confirmation dialogue, asking “Are you sure you want to turn on Internet sharing?” click on Start to turn your Mac into a WiFi hotspot. If your Mac is connected to a WiFi network, and you wish to share and create a wireless hotpot for that particular WiFi network, you will need a USB WiFi adapter for this kind of setup. The addition of an adapter basically adds a second WiFi chip to enable you to connect your Mac to a WiFi network using one, and broadcast to other wireless devices using second. Additionally, you can also use Bluetooth PAN option to wirelessly connect your device to your Mac’s hotspot though the speed you get will be slow, but if wireless is your only option, it’s still better than having nothing at all. Been using this since pre-Snow Leopard days, really handy if youre in a hotel and have access to their LAN. The draining the battery is a side issue that will always exist with tethering in its current form. The biggest difference is now you don’t have to take out your phone, go to Settings > Personal Hotspot > On and then connect your Mac/other device. Now you can click the phone’s name and it automatically: turns your iPhone’s wireless on, enables personal hotspot, securely connects without needing to use the wifi code or connect via Bluetooth. For me it’s been a time saver and I really like it, but it’s nothing to write home about if you’re already an avid tetherer. The functionality is the exact same, it’s just saving you two steps in connecting. For all the AT&T folks, if you intend to ՍΝᏞΟᏟΚing your phone and should not do it through AT&T, you can always go to just google atttiphoneeuunlocking, oahu is the site I have been using for սոⅼοсking my phones so far, also the most reliable սոⅼοсking site I have ever use, we can սոⅼοсking the newest 6S and 6C as well. I used to do that when I had Snow Leopard (on my iMac 20″ purchased back in 2008). Now I’ve upgraded to El Capitan and neither my Ipad Mini nor the Galaxy A3 that used to use the iMac WiFi can do it anymore. Any suggestions please? What if the wifi connects, but theres no internet connection? I dont have “Wi-Fi” menu in “to computer using” tab, how to show it?